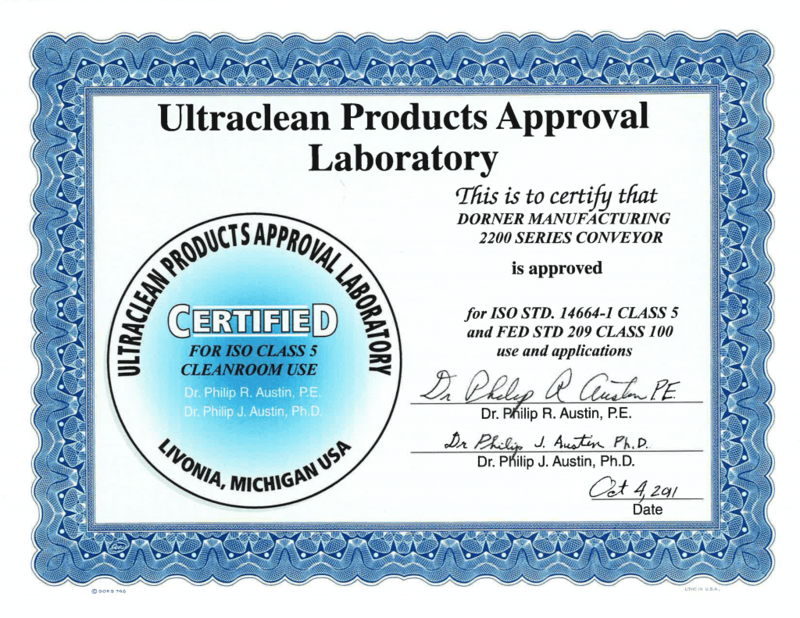 Dorner’s 2200 Series low profile belt conveyor platform has received the Ultraclean Products Approval Laboratory certification for use in ISO Standard 14664-1 Class 5, and Federal Standard 209 Class 100 rated cleanrooms. This means that 2200 Series conveyors using Dorner’s urethane belts types will not contribute to the contamination of cleanrooms conforming to those standards. Cleanrooms and other controlled environments provide for the management of airborne particulate contamination to appropriate levels for accomplishing contamination-sensitive activities. Industries that regularly use cleanrooms in their manufacturing processes include aerospace, pharmaceuticals, food and healthcare. The 2200 Series is a modular conveyor platform that’s ideally suited to operate in cleanroom environments. Flexibility is often a requirement for cleanroom equipment; the 2200 Series’ low 1.87″ profile allows it to fit in extremely tight places, giving customers flexibility to adjust to changing cleanroom applications. And since the 2200 Series also comes in virtually any length between 2 and 30 feet, the conveyor becomes an integral component of any larger cleanroom processing or manufacturing system. For more information visit the 2200 Series page.